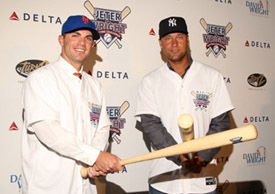 Jeter vs. Wright carries a new storyline this year, as the New York sluggers accepted Delta Airlines’ charity challenge. In other news, UMPS CARE kicks off its 2009 season, while the Phillies are still reigning champs at charity fundraiser. Jeter vs. Wright: NY1 reported that New York Yankees SS Derek Jeter and New York Mets 3B David Wright “are looking to out slug each other for charity by stepping up to the plate for their respective foundations” – Jeter’s Turn 2 Foundation and the David Wright Foundation. Jeter: “Pretty much is a win-win situation for both of us. Win or lose – you get some support for your foundation. I’ve had this foundation since 1996. David deserves a lot of credit for starting his. It always takes a lot of support for these foundations to be successful” (NY1.com, 4/4). Delta Airlines Senior VP Gail Grimmett: “Derek Jeter and David Wright are true fan favorites and hometown heroes. And through the Batting Challenge, fans will now have even more reason to cheer for them” (Corky Siemaszko, N.Y. Daily News, 4/3). UMPS CARE: MLB.com’s Samuel Dearth wrote that UMPS CARE Charities “officially threw out the ‘first pitch’ of the season” April 9 when umps Tim Tschida, Bob Davidson, Jeff Nelson and Mark Carlson visited Children’s Hospital Boston. The crew provided a Build-A-Bear Workshop experience through its BLUE For Kids program. Tschida: “We feel fortunate to be a part of the Major League Baseball family both on and off the field. UMPS CARE Charities provides a structured approach for the Major League umpires to participate in community outreach activities all across the country. The hospital visits are one of our favorite things to do, and what better place to start the season off then here at Children’s Hospital Boston” (Samuel Dearth, MLB.com, 4/9). Philadelphia Phillies: Philly’s KYW Radio reported that several Philadelphia Phillies players, including RP Brad Lidge, “were the guests of honor at a charity event” sponsored by CBS Radio, called “Cheers to the Champs.” The event raised over $20,000 for Children’s Hospital of Philadelphia (Jim Melwert, KYW1060.com, 4/7). Meanwhile, prior to opening their regular seasons, the top two affiliates of the Philadelphia Phillies – the AA Reading Phillies and the AAA Lehigh Valley Iron Pigs – squared off in a charity baseball game to benefit Baseballtown Charities, a non-profit that works to introduce inner city kids to the game of baseball. With the proceeds from the game, Baseballtown Charities hopes to help 300 kids in Berks County between the ages of 10 and 15 (WFMZ-Ind, 4/7). Travis Miller: Former MLB player Travis Miller visited with the Don Kromer Boys & Girls Club in Arlington, Texas, on April 6. Miller spoke about his life experiences, including being a Major League baseball player, suffering from Guillain-Barre as a child, and attaining his Master’s Degree in Organizational Management (Athletes For Hope).